Ok... so how do you get essential oils? There are quite a few companies, hundreds of different oils, & many different teams. It can get a little confusing at times. I personally have used doTERRA essential oils for 4+ years and I trust them implicitly. I also get ALL my oils for discounted, wholesale pricing. You can too. Want the scoop? Here it is! 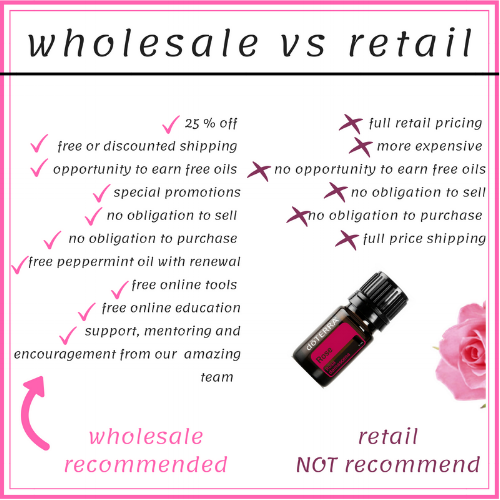 So what you are thinking now is you want a wholesale membership? That is exactly what I was thinking when I first got started! Here are the two ways you can do that! Similar to Costco or Sam's Club... except much better! Want even more savings? I thought so! Get your membership fee waived! Start your essential oil journey off on the right foot with 10 of the most common doTERRA essential oils. You will also get a diffuser in this kit. Diffusing essential oils is something I do every day, so in my opinion its essential! 15 ml bottles: Frankincense, Peppermint, Lavender, DigestZen, Lemon, On Guard, Melaleuca, Oregano, Breathe & Deep Blue (5ml). Petal Diffuser. If you really want to dive right in, this is the kit for you! This is often the kit that most people tell me they wish they would have started with! On Guard® Collection:, Beadlets, Toothpaste, Hand Wash w/2 Dispensers, Softgels, Sanitizing Hand Mist. This is another smaller popular kit. This is also a great starter kit. Consider adding a petal diffuser to this kit for only $47 or On Guard hand soap! This is another smaller popular kit. This is also a great starter kit. This kit includes popular 8 essential oils and a Petal Diffuser. Please email me some more information!